I was recently invited by Laurel at Chipping with Charm to participate in a blog tour. Laurel and I met last year and I fell in love with her upcycled and repurposed furniture and her decoration ideas right away. She shares a booth with a friend in an antique mall and sells her wonderful creations at some shows as well. These are a few of Laurel’s repurposing projects. Don’t you just love the bed canopy built from an old ladder, the memo station that once was a kraut cutter or the shelf she had made out of two old drawers and a sign? The wood tote, repurposed into a fairy garden, and the tired stand, made from old cake pans, are such adorable ideas too. There are many more on her blog. If you didn’t have the chance yet to meet Laurel, please hop over to Chipping with Charm and take a look around. I work on several things at the moment. One of them is a blog makeover. My header doesn’t reflect my current style and taste anymore. Exchanging the pictures would be easy but I like to get a totally new design. I also plan to give my blog a more organized look. If I had a budget for it, I would ask a web designer to recreate my blog outfit but I have to do it myself. This is a real challenge for me because I so much rather work with real materials and tools. Wish me luck :). Another work in progress is this scrap quilt. It had taken me a long time to finish the top and by the time it was done, my color taste had begun to change to more neutral colors. I hand quilted a few areas, but then the quilt took a nap for several years until recently. Now I’m ready to add some color to our interior again. Since I only quilt in the evenings while watching TV, it will take me some months though until the quilt will be finished. Additionally, I work on are a mixed-media collage, a metal assemblage and display ideas for some of the fabric fishes I sewed last year. That’s a tough one. What exactly is my genre? If you have followed me for a while, you have seen useful sewing projects, mixed media collages and art quilts, assemblages, altered arts, crafts, seasonal decorating, repurposing ideas, handmade jewelry, soldered items, a few crocheted pieces and more. I think, certain projects differ by the materials I combine. I like to mix lace with rusty parts, like in the “Rusty Flower Garden” wall hanging or the “For the Love of Lace and Rust” canvas. I also use such contrasts in my decorations by putting a rusty junk tree on a doily or with lace embellished Easter eggs on rusty bed springs. 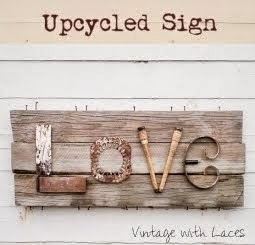 I started blogging in 2009 to share my creations, decorations and my love for vintage treasures. From the beginning on, I’ve written my blog in English even though I’m German, because I wanted to get in contact with bloggers from all around the world. Creating is not just a hobby, it’s a lifestyle for me. I’d be very unhappy if I couldn’t realize the ideas (or at least some of them) that come to my mind. I’m rarely uninspired. It happens more often that I find it difficult to decide which of all the projects on my “like-to-do” list to start next. Well, there is no specific process. Inspiration can hit me any time at any place. 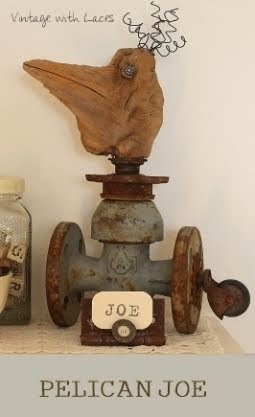 I might get an idea from some things I find while cleaning up my work table, something I’ve picked up in the garden or when I see an item at the junk yard, only to name a few occasions. Sometimes I start right away and the project is finished soon, on other creations I work in stages. Then it can take weeks, months or even years until completion. That’s enough about me. Now it’s my turn to provide new stops on the blog tour. You all know how life can get into our ways. That’s what happened to one of the three lovely ladies I wanted to introduce you to, but I still have two great blogs for you to visit. I know and love Angie’s blog for several years now. She shares free antique graphics, her love of farmhouse living and how she turns total junk into unique recreations for her home. She hosts a weekly blog party named “Knick of Time Tuesday”, where everybody can link up vintage or vintage inspired themed posts. Angie comes up with a lot of great repurposing ideas and does wonderful furniture makeovers. You got to see the roll top desk she had just finished or the guest cottage reveal from some weeks ago. The collage shows you just a few of my favorite projects from Angie’s blog. Please visit Knick of Time as well as Angie’s Etsy shop,where she sells her fabulous creations and vintage treasures. I just recently found JoAnne’s blog but immediately liked the touches of blue in her home and her charming cottage style. Thank you, Laurel for inviting me to the blog tour and thank you, Angie and JoAnne for playing along and continuing the blog tour next Monday. My Dessert Cottage. Since last year’s event, I redecorated, did some makeovers, built a spool shelf and added some soft bits of color here and there. Please grab a cup of coffee or tea and take the tour. It’ free of charge. My cutting table unit, which consists of two drawer chests placed back to back, got recently a makeover. I had never really liked the original pine wood color. Some years ago I painted the tops white but didn’t feel tempted to paint 30 drawers. My solution was to stain the wood with the vinegar and steel wool method. The brass colored drawer pulls got spray painted in black for a more industrial look. I’m really happy how everything turned out. You can check out the before version HERE. My glass cabinet still holds vintage linens but I redecorated it as well as the shelf above. Pelican Joe is residing on the little drawer shelf now where he has a good view and can check out what’s going on. The metal “S” is one of my favorite junk yard finds of last year. I actually found three letters. They all were orange, my least favorite color. I didn’t mind because I knew I would be allowed to use the sandblaster in a friend’s workshop. The paint came off easily and left them perfectly gray. I made this wind chimes last year with a piece of driftwood, lace, buttons and pearls. It hung outside in the patio during the summer but it didn’t have a perfect spot there. When I took it down in fall, I brought it into the studio to become a wall decoration. The linen covered boxes got updated with stenciled letters/numbers and painted stripes. My rusty rake is now used as jewelry display for necklaces I have received from blogging friends over the years, and some I created myself. I had repurposed this vintage metal washboard as a magnetic memo board three years ago. Back then, I had transferred a vintage French graphic on the top. For my actual taste this was too girlie and I painted over it with chalkboard paint a few weeks ago. On the side of my armoire you can see my “Rusty & Weathered” quilt, which was recently published in the summer issue of Art Quilting Studio. This made me especially happy because it is one of my favorite creations. Ever since I had seen THIS cable spool coffee table, I wanted to make one. When I found two small cable spools of the same size, I decided to build a shelf instead though. Right now I like the height as it is but if I change my mind, I can still add another tier with the remaining shelf and an empty paint can as support. I use a shadow box to store wasp nests, small driftwood pieces, seed pods and lavender. In a rusty baking tin I keep other nature finds like snail and sea shells. This little drawer chest got a makeover with vintage atlas pages. Touches of color. I know, it’s shocking. In the round basket I store freezer paper, fusible web etc. Lace and rusty junk side by side. They get along well with each other. The junky LOVE sign I had created for Valentine’s Day this year found a permanent place above the wicker trunk. I end the tour now with this close-up of a gray inspiration kit that I keep in a basket on the trunk. Thank you very much for your visit. It was a pleasure to have you here. I hope you enjoyed the tour. Please hop over to Karen tomorrow, when the link party has started. Thank you very much for hosting this great event again, Karen! I look forward to visiting the other participants.